At least 5, and perhaps as many as 20 children have suffered weakness or paralysis in one or more limbs. The median age of the patients is 12 years and the cases have been reported since 2012. One group of 5 patients recently presented at the American Academy of Neurology Annual meeting developed full paralysis within 2 days, and have not recovered limb function in 6 months. The cases are all located within a 100-mile radius. A mild respiratory illness preceded paralysis in some of the children. Enterovirus type 68 has been recovered from the stool of some of the patients. I do not have any more information on this outbreak other than what I’ve obtained from ProMedMail. I have worked on enteroviruses, including poliovirus, for over 30 years, so I thought I might speculate on what might be transpiring. What is a polio-like illness? Acute flaccid paralysis (AFP) is the term used to describe the sudden onset of weakness in limbs. AFP can have many etiologies, including viruses, bacteria, toxins, and systemic disease. It is used by the World Health Organization to maximize the ability to detect all cases of poliovirus. Confirmation that AFP is caused by poliovirus requires demonstration that the virus is present in the infected individual. Is poliovirus the cause? I do not believe that poliovirus is causing the paralysis of children in California. I understand that they have all been immunized against poliovirus. In addition, should immunization have failed in any of these children, it seems unlikely that wild type polioviruses would be circulating in this area. Vaccine-derived polioviruses can cause paralysis but the US has not used this type of vaccine since 2000. What might be causing the paralysis? AFP has both infectious and non-infectious etiologies. One possibility is that a non-polio enterovirus is involved. Poliovirus is classified within the genus Enterovirus in the family Picornaviridae. Other enteroviruses besides poliovirus are known to cause paralytic disease, such as Coxsackieviruses, echoviruses, and many enteroviruses including types 70, 71, 89, 90, 91,96, 99, 102, and 114. Most enterovirus infections can be associated with different clinical syndromes besides paralysis (such as respiratory disease), and therefore diagnosis is difficult. Stool is generally the most sensitive specimen for establishing an enterovirus infection. However, the virus may no longer be present at onset of symptoms. Polio is much easier to diagnose in individuals with AFP from whom virus can be identified: paralysis is the main serious symptom caused by infection. However note that 99 out of 100 poliovirus infections are asymptomatic or present with undifferentiated viral illness. The incidence of paralytic disease caused by other enteroviruses is even lower – for example 1 in 10,000 EV71 infections are paralytic. If all of the 20 California cases are caused by enteroviruses, this means that there have been many more infections without symptoms. In one study of non-polio AFP in India, no virus could be isolated in 70% of the cases. 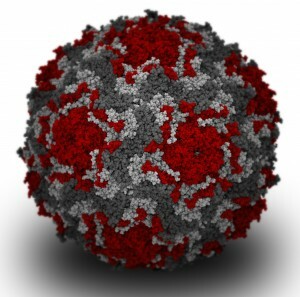 Enterovirus 71 was the single most prevalent serotype associated with non-polio AFP. This virus currently causes large outbreaks of hand, foot, and mouth disease throughout Asia, with many fatalities and cases of acute flaccid paralysis. EV71 is known to circulate within the United States. What about enterovirus 68? It has been reported that EV68 has been isolated from some of the paralyzed children. This isolation does not mean that the virus has caused the paralysis. Enterovirus infections of the respiratory and gastrointestinal tracts are very common and often do not result in any signs of disease. Random samplings of healthy individuals frequently demonstrate substantial rates of enterovirus infections. Enterovirus type 68 was first isolated in California from an individual with respiratory illness. The virus is known to cause clusters of acute respiratory disease, and there is at least one report of its association with central nervous system disease. I believe it is an unlikely cause of the paralytic cases in California based solely on the past history of the virus and the fact that other enteroviruses are more likely to cause paralysis. It is not clear to me why enterovirus 68 would evolve to become substantially more neurotropic: entering the central nervous system is a dead end because the infection cannot be transmitted to a new host. All of the above is pure speculation based on very little data. The paralysis might not even be caused by an infection. At this point a great deal of basic epidemiology needs to be done to solve the problem – if indeed it can be solved at all. Based on its population, California would be expected to have about 75 cases of acute flaccid paralysis each year of various etiologies, suggesting that the current number of cases is not unusual or unexpected. Update: N. Gopal Raj wrote a story last year about acute flaccid paralysis in India, which has the highest rate of non-polio AFP in the world, with 60,000 cases reported in 2011. Any of those viruses are possible. As well as any number of noninfectious etiologies. I doubt it will be sorted out, especially as some of the cases are over a year old. thanks so much for posting this Vincent. I understand the domain is highly uncertain, but it is still very helpful to understand your deeply informed perspectives here on the context in which this is all occurring. This is polio folks, all the WHO really did to ‘eradicate’ polio was to change the name to Non-Polio Acute Flaccid Paralysis… They are making billions off of all you whom blindly fall for their lies in order to buy their vaccines, which in not natures way of healing you. Vaccines Kill! Stop vaccinating your child, I humbly urge you to consider! !